I saw this challenge hosted by Callapidder Days and decided I'd take part in it. 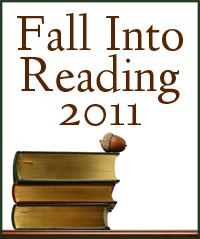 To learn more about the Fall Into Reading 2011 challenge go here, or click on the button at the top of this post. The rules are really simple. Basically you make a list, any length that's comfortable for you, of books you want to read this fall and then start reading! I don't read many romance novels so I am not familiar with any of these, but I trust you've made a good list! It's nice to find another person who likes to read books more than once! :) Happy reading! So glad you decided to join Fall Into Reading! Though it can be tempting to make a super-long list, it makes sense to me to keep things manageable and 10 books sounds great! Besides, we can always read more if we finish our initial list, right? :) Thanks for being part of the challenge. Enjoy your fall reading!